Welcome to Heart Path Journeys • Sacred Maui Retreats! Heart Path Journeys is owned and operated by Inspirational Speaker and Author, Eve Eschner Hogan and offers personalized private retreats created just for you or you and your guest or your family, as well as small group retreats. We take the hard part out of planning a retreat — whether your focus is spiritual growth, physical or emotional healing, creative expression, or improving a relationship — with yourself, a loved one, your family or with Spirit. How it works is up to you! We will work with you to completely customize your retreat sessions based on your interests, needs, budget, time, desires and intentions. 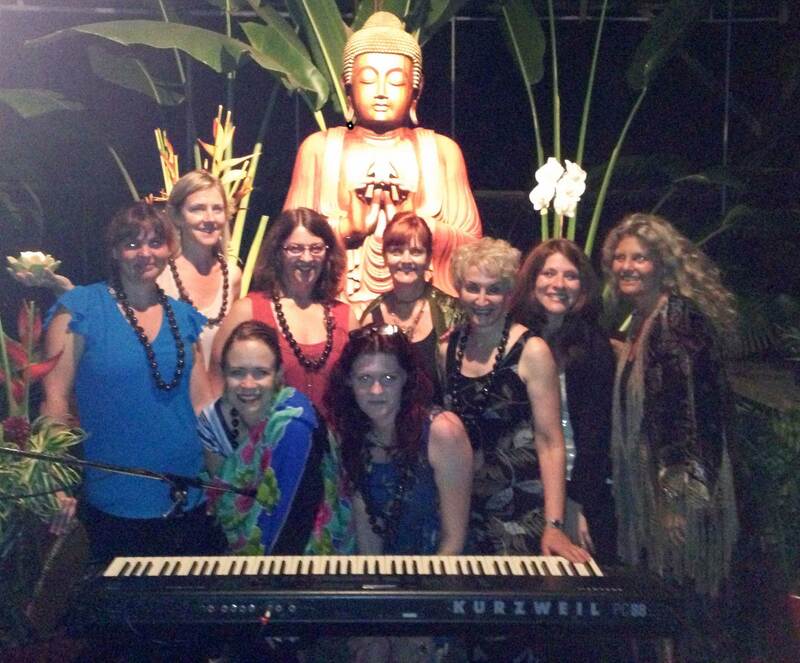 The Heart Path Journeys’ team is made up of Maui’s best practitioners offering expertise in a variety of modalities—relationships, spirituality, nutrition/wellness, yoga, intuitive, energy healing, massage… Our practitioners are all specifically chosen as exceptional healers in their field. RATHER THAN COMING WHEN WE ARE OFFERING A RETREAT, WE OFFER A RETREAT WHEN YOU COME! We balance your retreat to honor the body, mind, and spirit, gently guiding you to access the healing wisdom of your heart. We serve as your concierge of personal growth and self-mastery. Maui offers a diverse and beautiful backdrop for growth and wellness. While the island is well-known, world-class beach destination, many are unaware of the immense beauty that awaits just off the beaten path. Heart Path Journeys takes you into the heart and soul of Maui—to awaken your own heart and soul. Which retreat is for you? Private Retreats allow you to gain the knowledge of a workshop while focusing solely on your own growth and healing issues, one-on-one with the practitioner (or two-to-one for relationship retreats or friends on retreat together). We build the retreat itinerary based 100% on your needs, timeline, budget and needs. All the sessions are tailored specifically to you. You can stay on site in private accommodations or at other island accommodations of your choice. The beauty of a private retreat is that it is built specifically for you, and offered specifically when you can come. Group Retreats offer a preset itinerary and topic, shared housing and the power of group dynamics. You will have the opportunity for immediate practice of relationship skills, make great new friends and a deeper awareness of similarities of the human dynamic, allowing us to learn from each other. Experience the sacred side of Hawaii—and yourself! Heart Path Journeys is owned and operated by Eve Eschner Hogan and is a sister-company to SpiritQuest Retreats in Sedona and Maui Healing Retreats. HPJ is based in “upcountry” Maui on the boundary between the two charming communities of Makawao and Haiku. Writer for Spirituality and Health Magazine. She is the the Executive Director of the Divine Nature Alliance a 501(c)3 which runs The Sacred Garden on Maui. Eve and her husband Steve also own and operate Makena Coast Dive Charters. Eve has been a leader in the field of personal and spiritual growth for nearly 30 years. The Sacred Garden is a healing sanctuary and nursery, offering two labyrinths, meditation gardens, beauty, serenity and peace for your enjoyment. A garden tour and access to the immensely beautiful grounds is part of your retreat experience. Complementary tea, hot chocolate or water always await you there. In addition to personalized, private, one-on-one sessions and retreats, Heart Path Journeys now offers group retreats as well as group presentations and workshops for groups that you bring to Maui. Whether you are a women’s group, a family, an organization or just a group of friends, we offer Mini-retreats (as few as a couple hours) up to a multiple day experiences for your group. We also have charming accommodations for small group retreats and we can assist you in finding a additional accommodation in the same vicinity. Each retreat guest will be granted full access to the 9 acre farm, a tour of the farm will be included as well as opportunities to learn about coffee growing and harvesting, water lily ponds, kukui nuts (the Hawaiian State tree), native and endemic plants, and food from the garden will be served. Tours of other nearby farms will also be offered, as well as basket weaving and other local arts. Can’t come to us? Let us come to you! Eve and our team of practitioners are ready to take this journey on the road! If you need a powerful presenter or facilitator for your retreat, let us know and we will come to you. We have a portable canvas labyrinth, lots of references and powerful tools to share!